Including oats in your diet is beneficial for many reasons, but knowing how to incorporate them or how much to eat might be more challenging. Whether your goal is to lose weight or stay healthy, consider adding this food to your diet. Oats are packed with fiber, some protein, vitamins and minerals, and they provide numerous health benefits. The soluble fiber found in oats helps lower low-density lipoprotein (LDL) cholesterol, which means oats can potentially help lower your risk for heart disease. 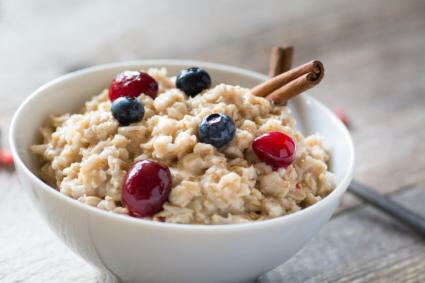 Eating oats also helps with weight loss and fat loss, improves waist-to-hip ratio, and enhances liver function in people who are overweight or obese, according to a 2013 study published at Pub Med. Since oats are naturally gluten-free, they are an excellent choice for people with Celiac disease or gluten sensitivity as long as the oats aren't processed with products which contain gluten. So, a diet with oats is best for people with high cholesterol, people who are overweight or want to maintain a healthy weight, and people who can't tolerate gluten. 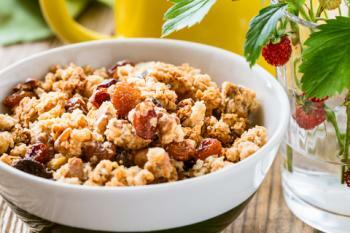 The amount of whole grains you should eat daily, including oats, depends on your calorie needs. The Dietary Guidelines for Americans 2015 provides the following recommendations for grains based on your daily calorie intake. *A serving of grains equals ½ cup of rice, pasta, or cooked cereal, 1 cup of ready-to-eat cereal, or a medium slice of bread. Choose at least one portion of oats for your daily grains allotment to reap the health benefits. Oatmeal diets focus on eating oatmeal for several of your meals daily. When following the Oatmeal Diet, you eat nothing but oatmeal for the first week, and then taper off and eat oatmeal two to three times per day. You're encouraged to eat six small meals daily, with calorie allotments ranging from 900 to 1,300 calories. The reason the Oatmeal Diet works for weight loss is because it restricts your calorie intake and helps you feel full from fewer calories. You can follow the Oatmeal Diet long-term as long as the rest of your diet is well-balanced, but you should check with your doctor if your calorie intake drops below 1,200 calories daily. Adding oats to your meal plan can provide you with several health benefits, and it's advantageous for healthy weight management. With all that going for them, it's worth incorporating them into your diet.